↑ "Who is Jamal Khashoggi?". Al-Jazeera. 喺2018-10-15搵到. ↑ "Jamal Khashoggi: An unauthorized Turkey source says journalist was murdered in Saudi consulate". BBC News. 2018-10-07. ↑ 3.0 3.1 "Speakers". International Public Relations Association - Gulf Chapter (IPRA-GC). 2012. （原先內容喺11 May 2012歸檔）. 喺10 May 2012搵到. ↑ 4.0 4.1 Hendley, Paul (2010-05-17). "Saudi newspaper head resigns after run-in with conservatives". Al Hdhod. 喺2018-10-11搵到. ↑ "Moments in disappearance, alleged slaying of Jamal Khashoggi". 華盛頓郵報. 喺2018-10-25搵到. ↑ "中東股神電視台 開台半日停播". 星島日報. 喺2018-10-25搵到. ↑ "La chaîne Alarab du prince saoudien Al-Walid a commencé à émettre". 20 Minutes. 2015-02-01. 喺2018-10-25搵到. 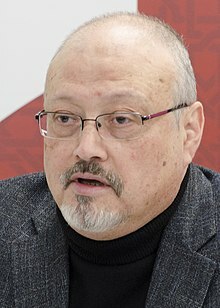 ↑ "Turkey to search Saudi Consulate for missing journalist". The Washington Post. 9 October 2018. 喺13 October 2018搵到. ↑ Nicholas, Cecil (10 October 2018). 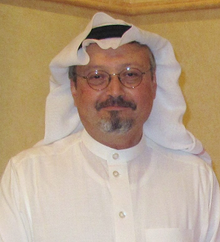 "Jamal Khashoggi: Saudi journalist 'cut up with bone saw in Pulp Fiction murder at consulate in Istanbul'". London Evening Standard. 喺14 October 2018搵到. ↑ "Sen. Corker: Everything points to Saudis being responsible for missing journalist". MSNBC. 12 October 2018. ↑ "Turkish prosecutors 'find evidence of Jamal Khashoggi killing'". Al Jazeera. 15 October 2018. 喺17 October 2018搵到. ↑ "土耳其稱掌卡舒吉被殺錄影錄音". 明報加東網 (用中文寫). 喺2018-10-25搵到. ↑ "土耳其官员：失踪记者卡舒吉在沙特领事馆遭分尸". 聯合早報 (用中文寫). 2018-10-17. 喺2018-10-25搵到. ↑ "卡舒吉被殺案 沙特說法一改再改". 明報 (用中文寫). 喺2018-10-25搵到. ↑ "沙特证实记者卡舒吉已经死亡". 德國之聲 (用中文寫). 喺2018-10-25搵到. ↑ "蓬佩奧：沙特承諾公佈失踪記者卡舒吉調查結果 (粵語)". 美國之音粵語組. 喺2018-10-25搵到. ↑ "王子與總統的鬥爭：卡舒吉案引發地緣政治紛爭". 紐約時報中文網 (用中文寫). 2018-10-24. 喺2018-10-25搵到. ↑ "美国总统特朗普称沙特王储对卡舒吉被杀事件负有最终责任". 路透社 (用中文寫). 喺2018-10-25搵到. ↑ "沙特王儲聲言會懲處涉記者卡舒吉被殺案所有罪犯". 香港電台 (用中文寫). 喺2018-10-25搵到.